Communicating Effectively With Your Asperger's Partner: Five Important Suggestions | Kenneth Roberson, Ph.D. Communicating effectively is the key to a successful relationship yet it is the very thing that people with Asperger’s have the most difficulty doing. If you are in a relationship with someone who has Asperger’s, the work of creating and maintaining effective communication may fall largely on you. Here are five recommendations for creating the kind of communication that will promote a successful, lasting relationship. Communication patterns develop early on in a relationship. The best time to create effective communication with someone is at the very beginning, before misunderstandings have a chance to develop and negative dynamics are set in place. People with Asperger’s have a hard time making changes in relating once communication patterns are entrenched. Once ineffective patterns are developed, change typically happens slowly and sometimes painfully. If it’s early in your relationship, focus on what needs to change about the communication between the two of you, let your partner know what you expect and want, develop a plan in consultation with your partner and work to carry out that plan regularly and consistently. The same can be said if your relationship is in a mature phase. The time to change ineffective communication patterns is now. Waiting only makes it harder. Clear and direct, spoken or written, communication works best in a relationship with an Asperger’s partner. Nonverbal communication, such as actions and behavior, gestures, body language, facial appearance and other indirect expressions are very difficult to understand and respond to for someone with Asperger’s. As often as you can, translate your nonverbal communication into direct language so that your partner has a better chance of understanding you. If, for example, you tend to concentrate when listening let your partner know that your serious look doesn’t mean you are angry or critical, it is simply your way of focusing on what’s being said so that you catch what’s important in the conversation. Encourage your partner to do the same, that is, let you know what he or she really means through actions, gestures, body language, etc. Make a list or chart for your partner of the nonverbal expressions that you tend to use and what they mean. Go over this list with your partner and make sure whatever is confusing is clarified so that both of you are on the same page. This will promote effective understanding and minimize the confusions and misconceptions that are likely to occur due to the limitations of Asperger’s. Your Asperger’s partner is probably accustomed to being corrected, even criticized, for the way he or she communicates, to the point where this is what is expected. Even though you are not trying to be judgmental or critical you may appear to be so, because this is what your partner has experienced so often. Perception is everything when it comes to communication. You need to express your feelings, needs, and expectations. Don’t hide them just because they have caused difficulty in the past. Rather, focus on making sure you let your partner knows that these are your feelings, needs, etc. and not indirect criticisms of your partner’s shortcomings. Instead of pointing out what your partner is doing that you don’t like, or is not doing that you would prefer, frame the conversation in a positive way by focusing on how improvements can be made. Make a point of stating exactly what is needed for the two of you to communicate better and be sure to include what you can do to help with those improvements. 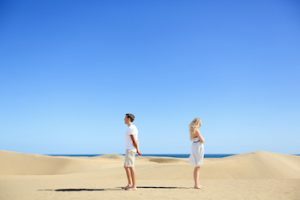 Focusing just on how your partner should change without including what you can do to make things better will likely reinforce your partner’s assumption about being criticized and judged. The fact that your partner has trouble understanding what you are thinking and feeling is good reason for you to take extra measures to communicate effectively yourself. For example, try to avoid accusations. That only leads to greater misunderstanding and eventual resentment. Be patient but persistent. Give your partner time to think about and respond to your concerns. Stay calm. Take a deep breath in the midst of misunderstandings, focus on facts rather than assumptions, and try to compromise as much as you can. Take one topic at a time. Too many subjects all jumbled together will be hard for your partner to understand and difficult for the two of you to achieve. Work as a team. Neither of you is right all the time, just as neither of you is always wrong. You will need to reach your relationship goals by working together, focusing on the specifics of what needs to change, and viewing that change as a joint venture. As you and your partner work towards better communication, consider the advantages of making small steps towards that goal. One step at a time, rather than rushing forward all at once, is a powerful technique. Remember the adage – Take small steps each day. You may not get there today but you’ll be closer than yesterday.